About a year ago I sent a survey to all of my followers asking them what kinds of things they might want to see me write about or produce on my blog. 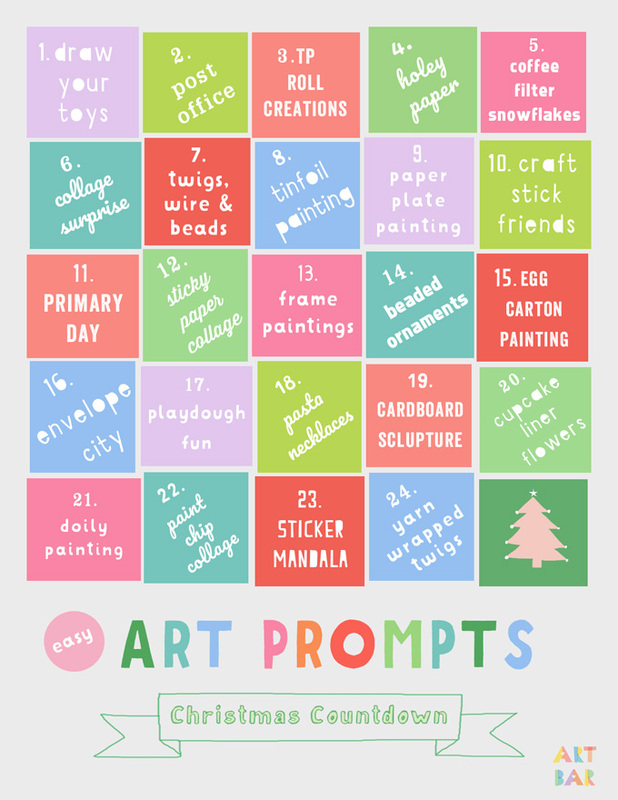 Several followers asked for an Art Prompts Advent Calendar Printable. I wasn’t sure exactly what that meant or what it might look like, so it took me a while to figure this out. Thanks to the help of some savvy blogger friends, I went with something simple. 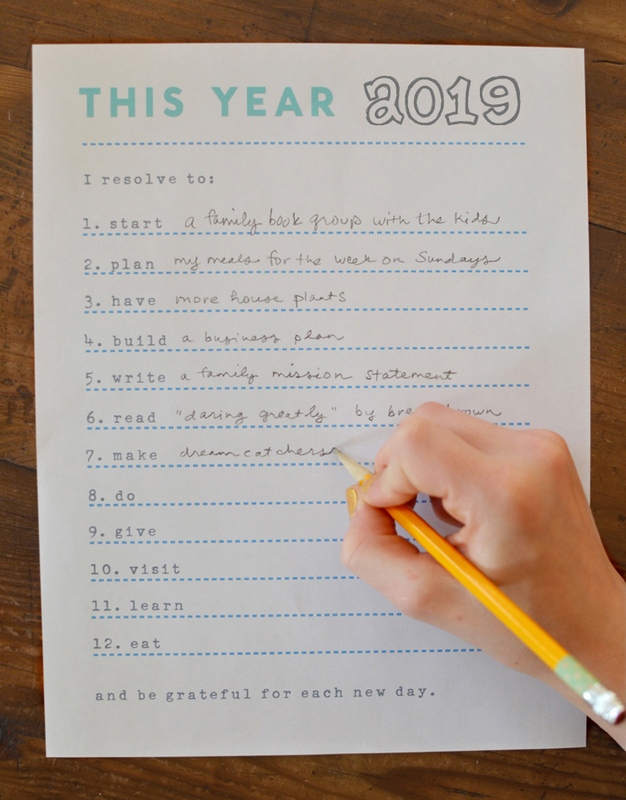 A one page printable! 2. Hang it up somewhere prominent! 3. 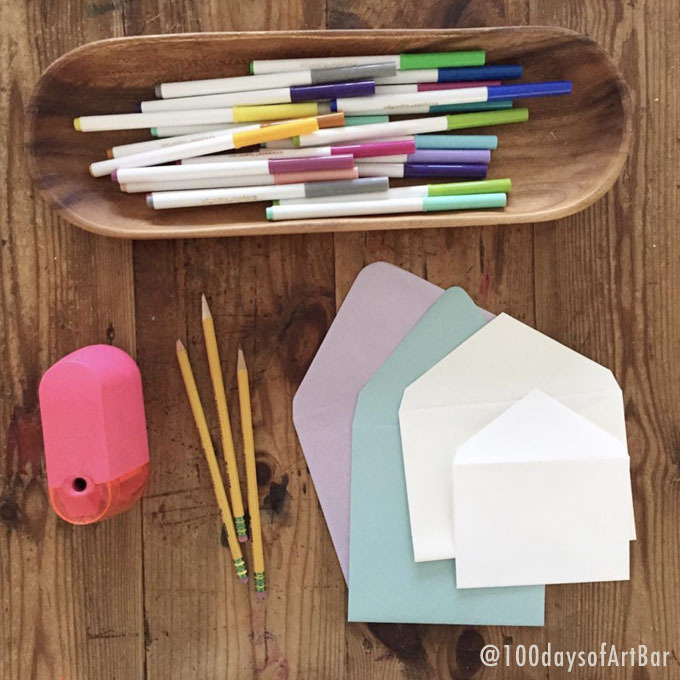 Come back to this post every day to read about each new prompt and grab the supply list. To make things even easier, I have created a Master Supply List that can print and bring to the store just once so you will have everything you need for the month. Or order it all on Amazon by clicking on the links below each photo. And now, without further ado, here are your Art Prompts! 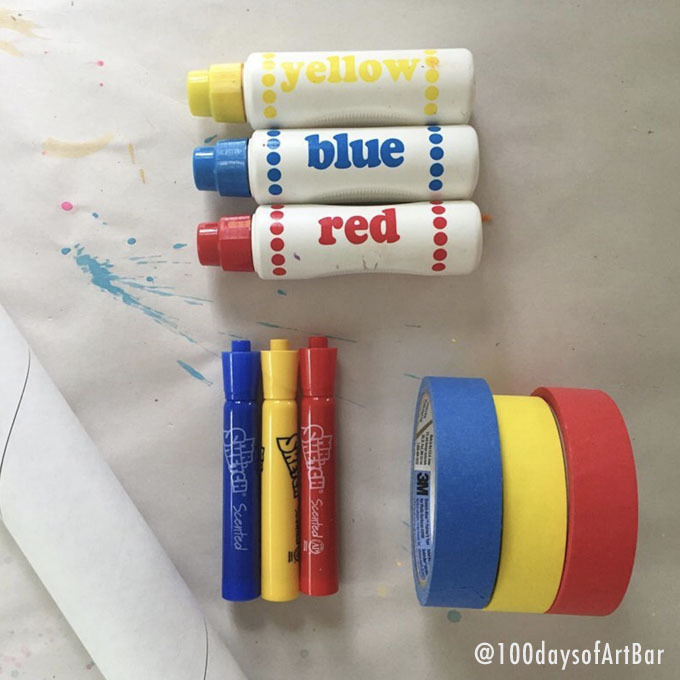 Have your child draw their toy from observation. Then paint. This shoebox has not been decorated. 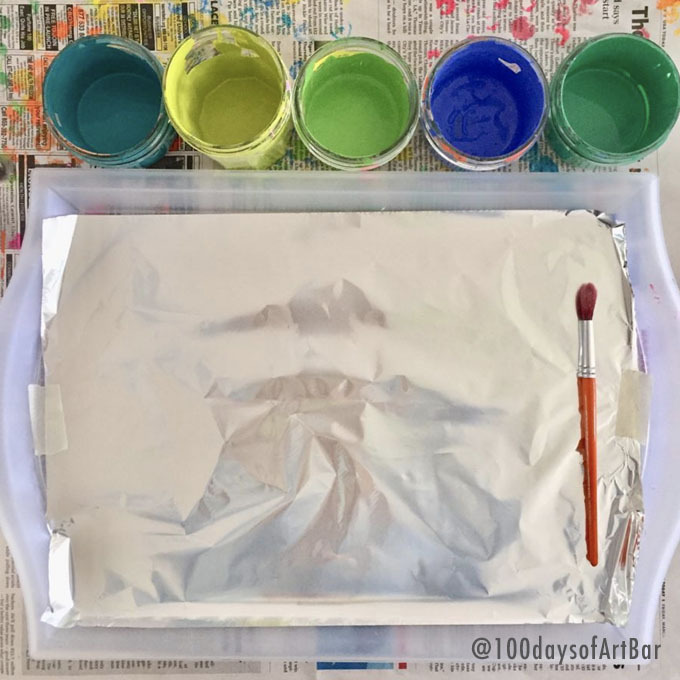 It doesn’t have to be, but you can make it look more like a post office box if you have the time. 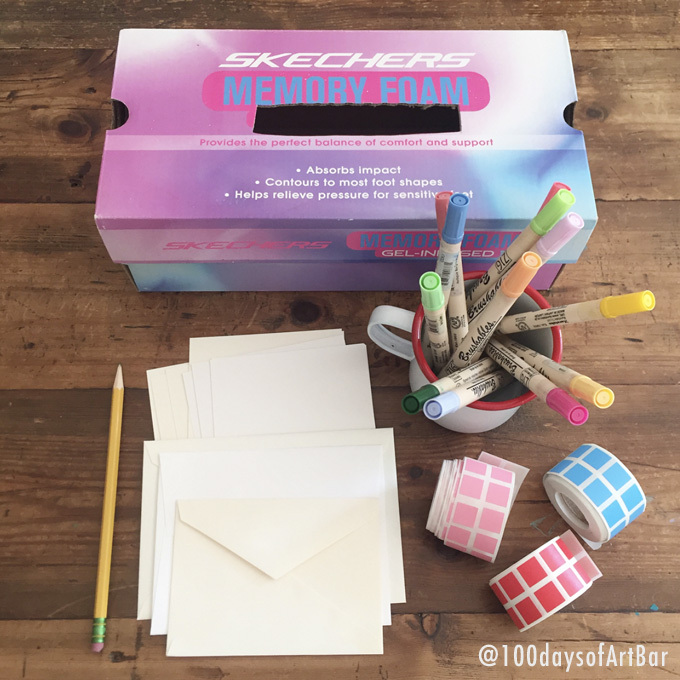 The kids will LOVE making pretend mail and sticking it in the slot! For little kids, pre-punch the rolls with holes. They can use regular markers or crayons if that’s all your have. I have a collection of paper punches that we used often in art class. If you don’t have these they you can fold the paper in half and cut circles that way. 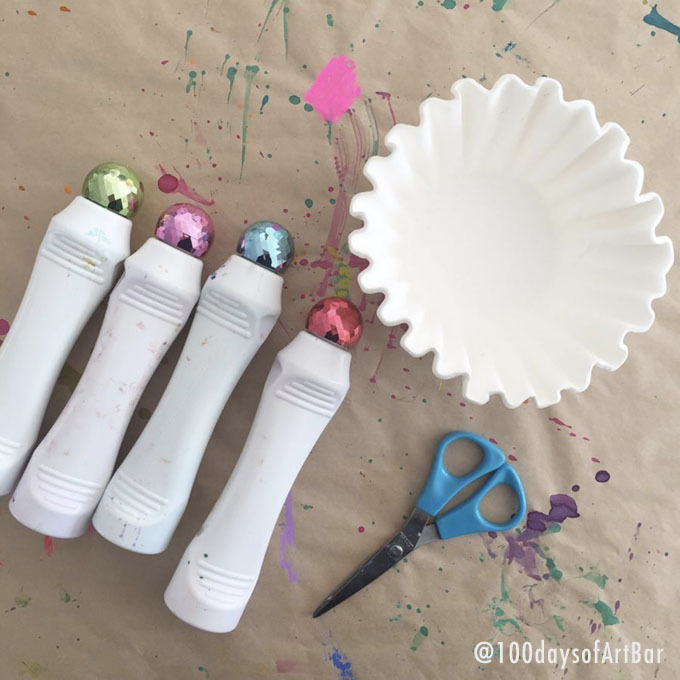 The gel sticks are cool because they are water-based and you can use a paintbrush to blend. 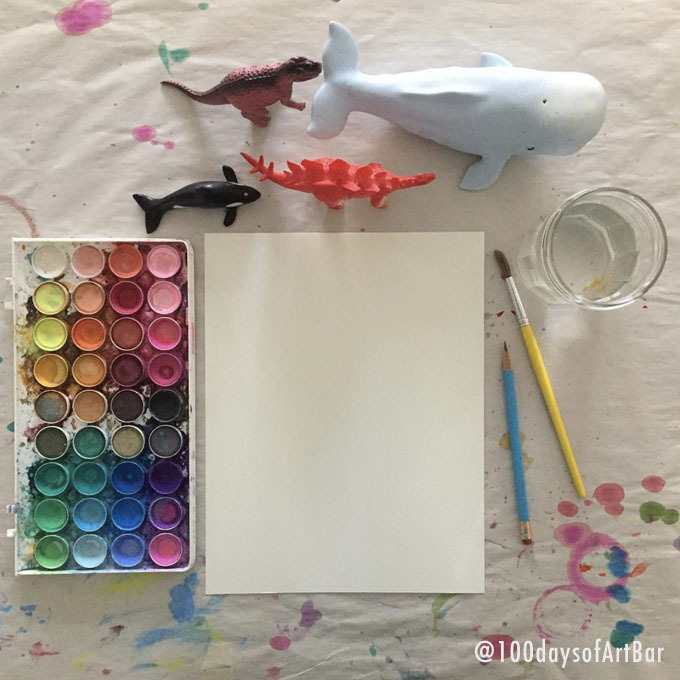 Using the oil pastels or crayons with watercolor is a cool technique because oil and water don’t mix. The littles can just explore the dotters on the coffee filters. 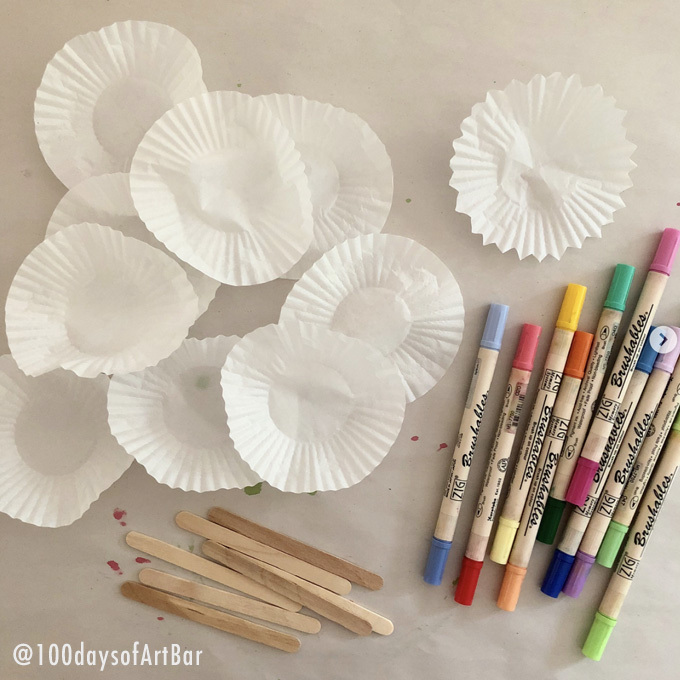 Older kids can fold the filters like you would make a traditional snowflake – by cutting out small shapes and then opening it back up. 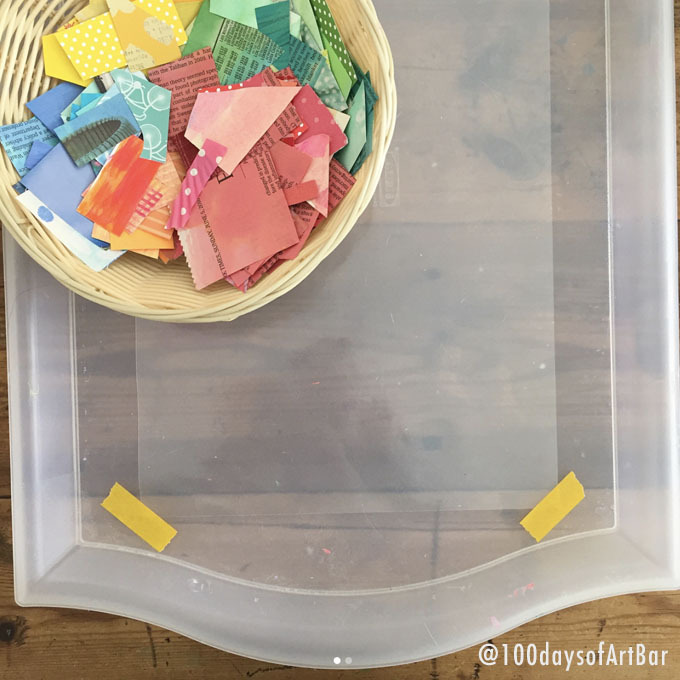 Kids will LOVE seeing a clear container full of collage material! 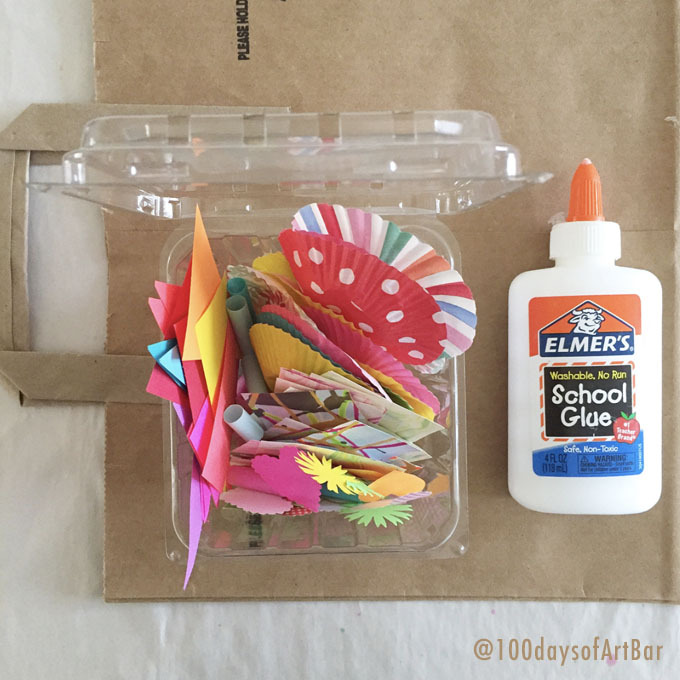 Fill with any scraps you have around. I like to pre-cut the wire and secure it with a bead. 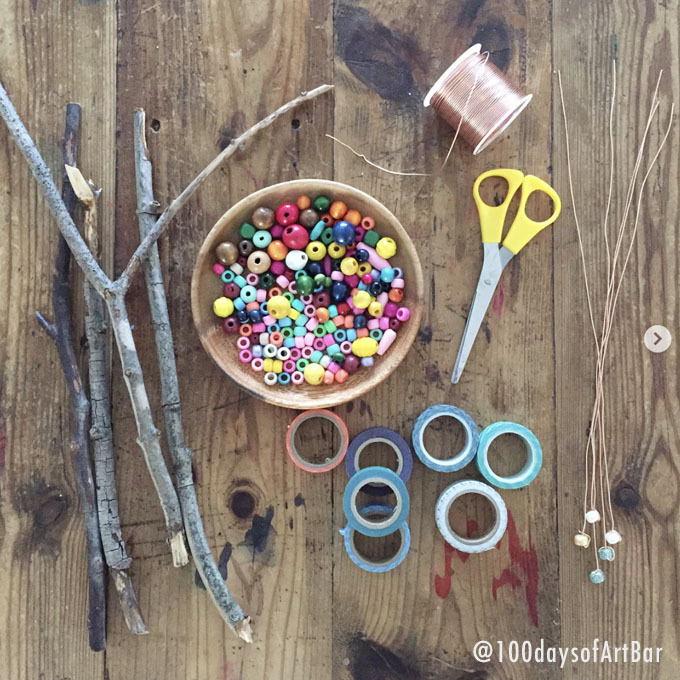 Kids can bead the wire the hang it from twig or wrap it around twig or do anything they want. A wonderful, shiny surface that kids can glide their brush across. 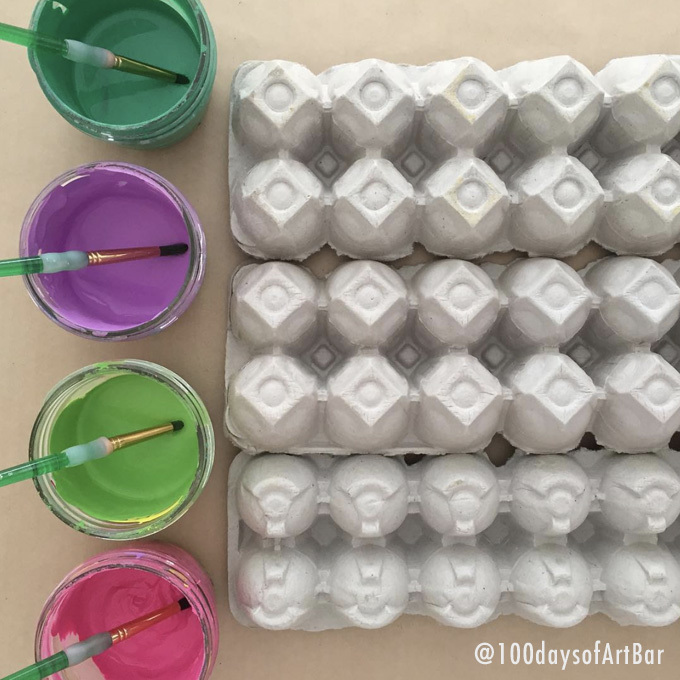 Use an easel if you have one! Little ones love to paint and cut. This is a perfect prompt for their exploration. For older kids, they can make faces or flowers or just something abstract. My art students never get tired of this one! I sometimes see them cut the craft sticks in half to make babies. This is less about mixing primary colors than just recognizing them, playing with them, and making some Lichtenstein-esque “pop-art”. Tape corners down to a surface, sticky side up. 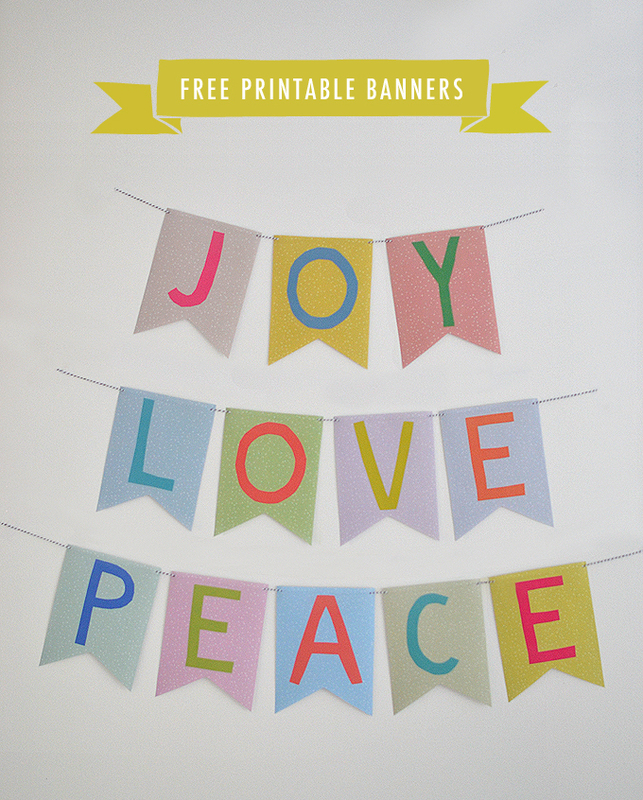 Once they have finished sticking collage bits on – place another sheet of adhesive paper on top to seal it. You can also put out magazines so the kids can cut out faces and letters. I’ve also done this with flowers and leaves. 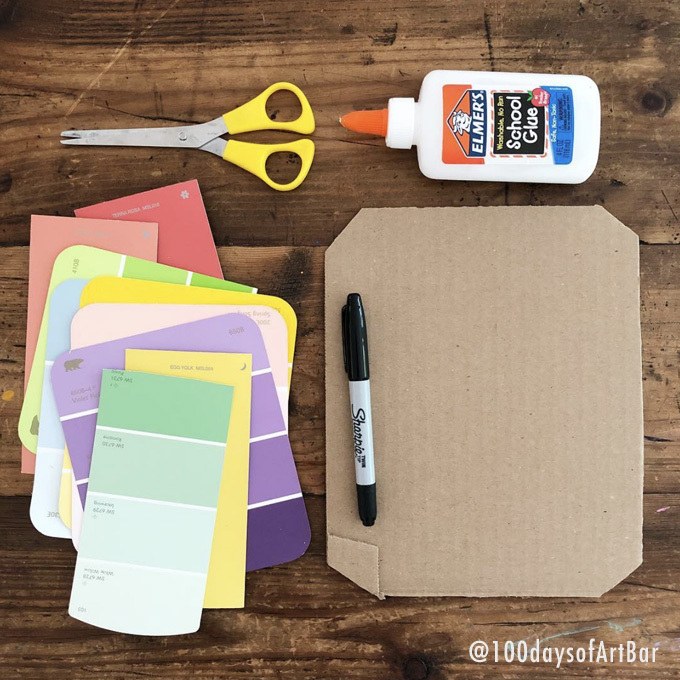 Just tape the paper down evenly all around to a table, tray, or piece of cardboard. After painting is dry, carefully peel off tape. 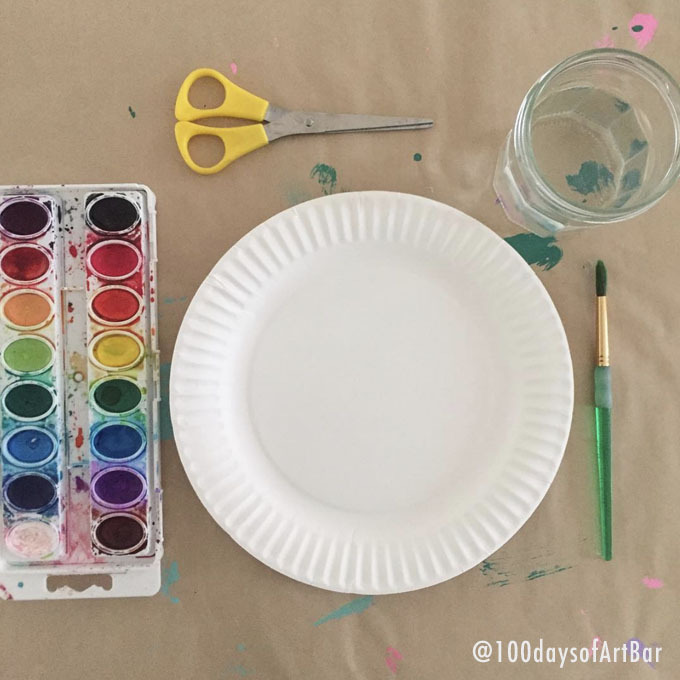 It’s amazing how a white border can transform a simple painting into a masterpiece! Cut a piece of wire about 18-20″ and add a stopper at the bottom. After the kids have beaded, secure the top. Now have them twist the wire into a ball. Tah-dah! You now have an eclectic and colorful ornament. Of course you don’t have to make an ornament at all, you can just let you child explore the bendy nature of the wire. Simple and always inviting. 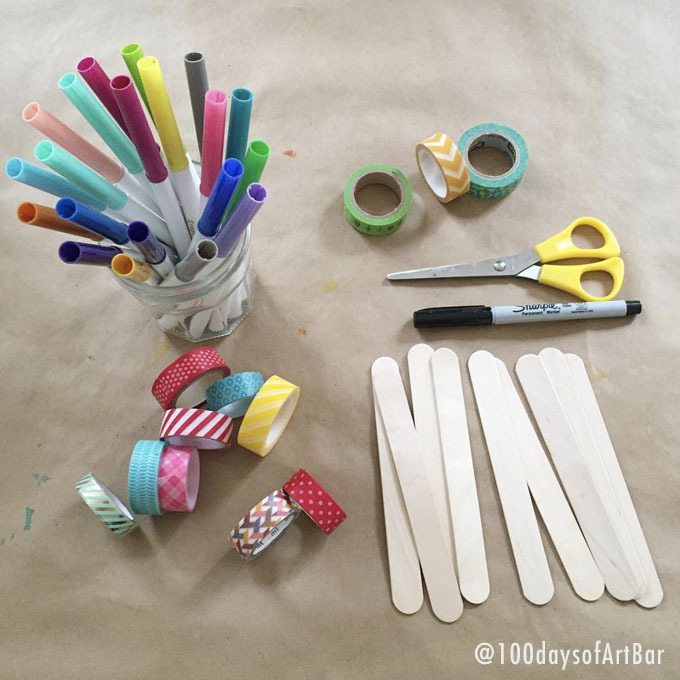 You could extend this prompt with collage material and glue. Fold the flap up and it becomes a perfect house shape! If you don’t have an electric sharpener, get one for the future. Sharpening pencils is an activity in and of itself! 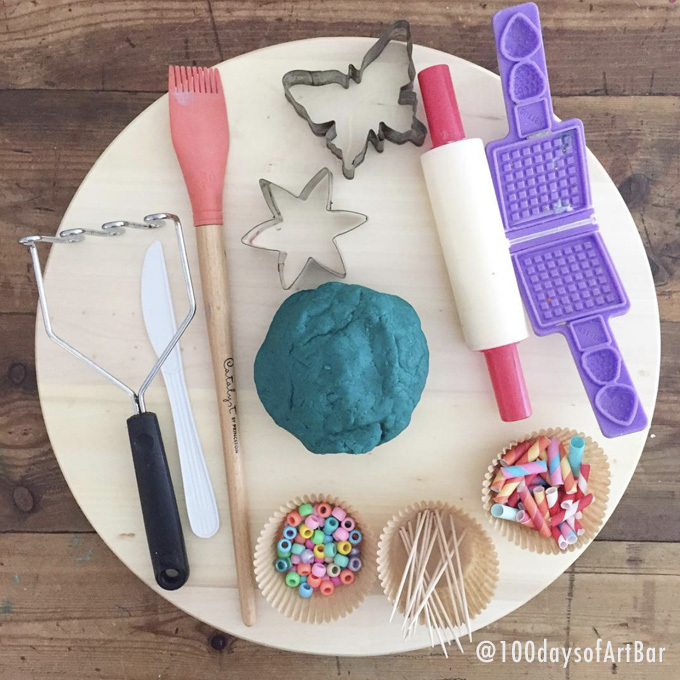 Get homemade playdough recipe here (glitter optional). My kids never ever tired of playdough. It always was my go-to during their childhood. That waffle maker needs to be in a frame! They all fought over it and I could never find another one. You can really gather anything that has a hole for stringing. Have the kids paint first. When everything is dry, string into a necklace. If your child doesn’t want a necklace, they can bend the wire into a sculpture. 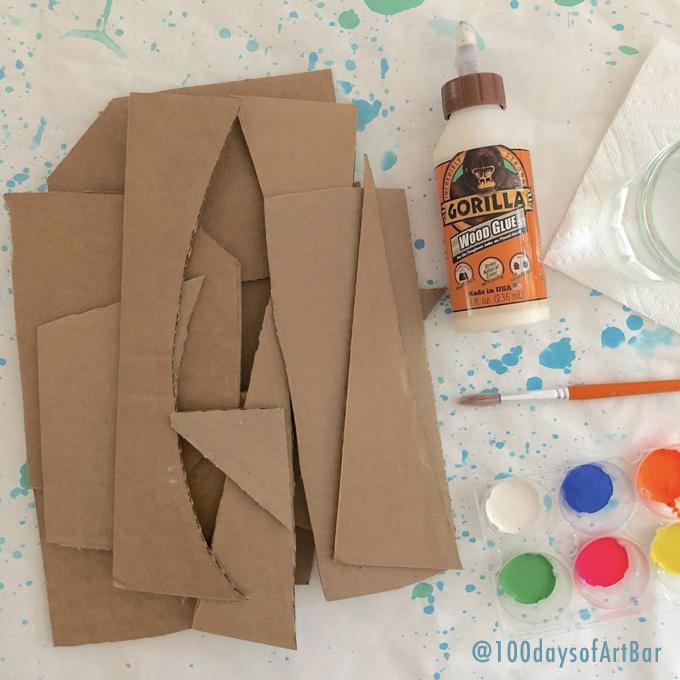 Whenever I need a quick creative invitation, I always turn to cardboard. The more scraps you can put out, the better. You can add other things, too. 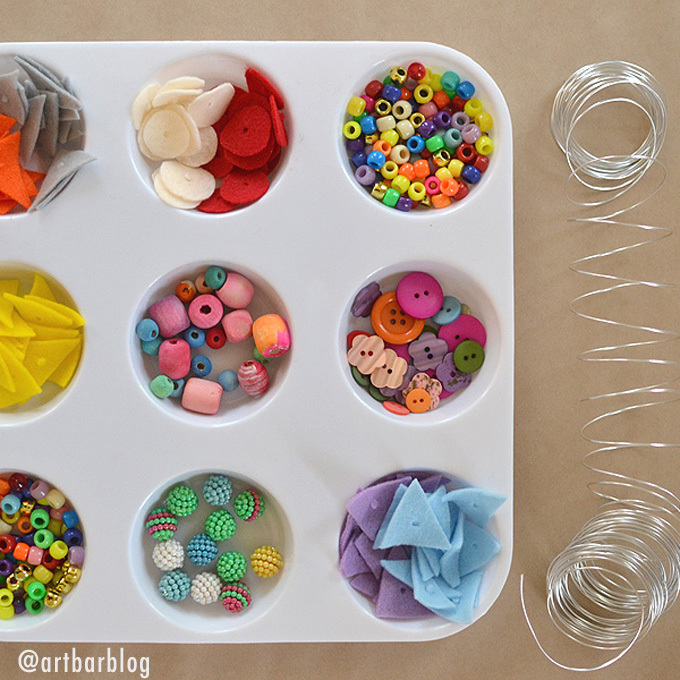 Like buttons or bottle tops or beads. Flatten out the liners. After they are colored, tape or glue to the sticks. Or glue to a piece of paper. If your child is not into flowers, they can make anything they want! I always like to have a piece of cardboard handy in case they want to make a collage. This is especially engaging for the kid who pays attention to detail. 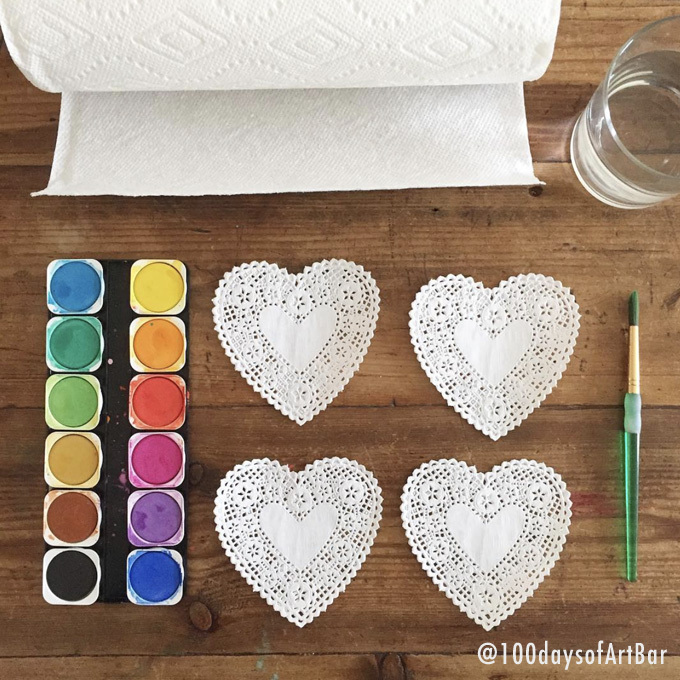 You can also paint on top of white paper – the negative space it creates from the cuts in the doily is very cool. 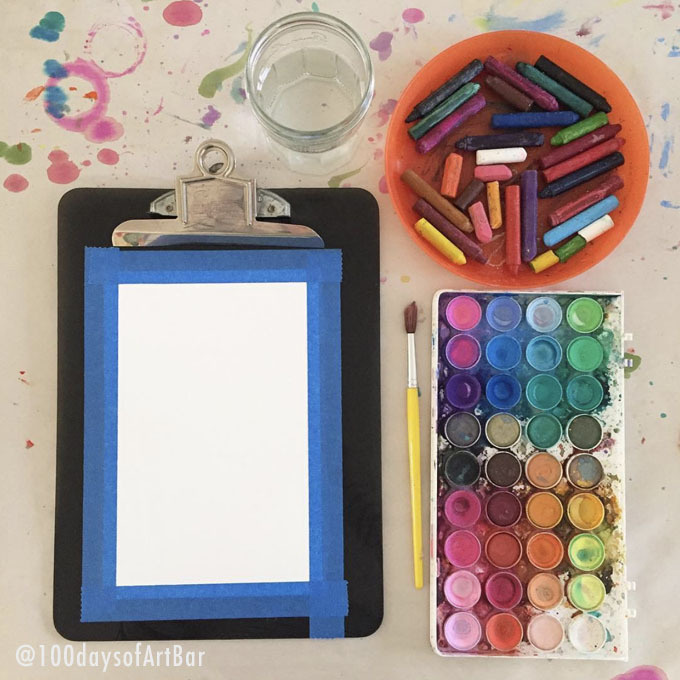 You can prompt your child to draw first with the Sharpie, then cut the colors up into smaller pieces and fill in the drawing. Or they can cut and glue first then draw on top. 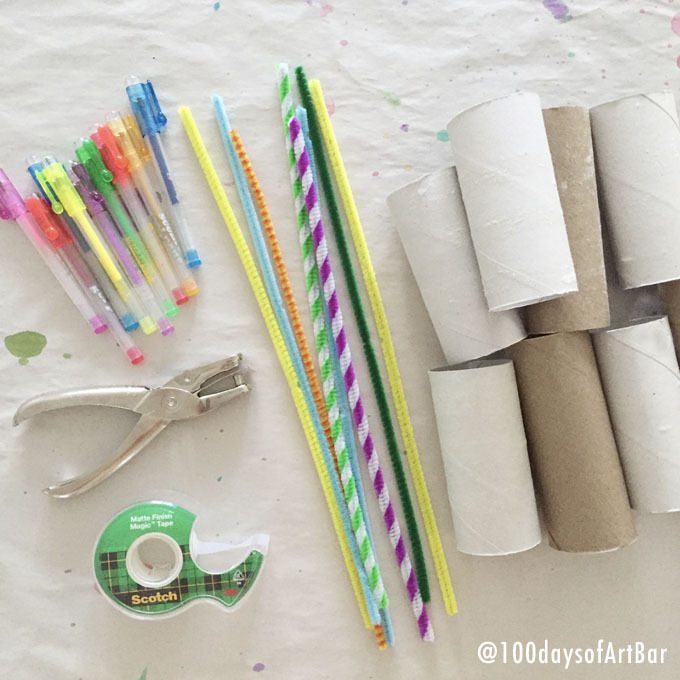 With just these two supplies, kids can make something so cool. 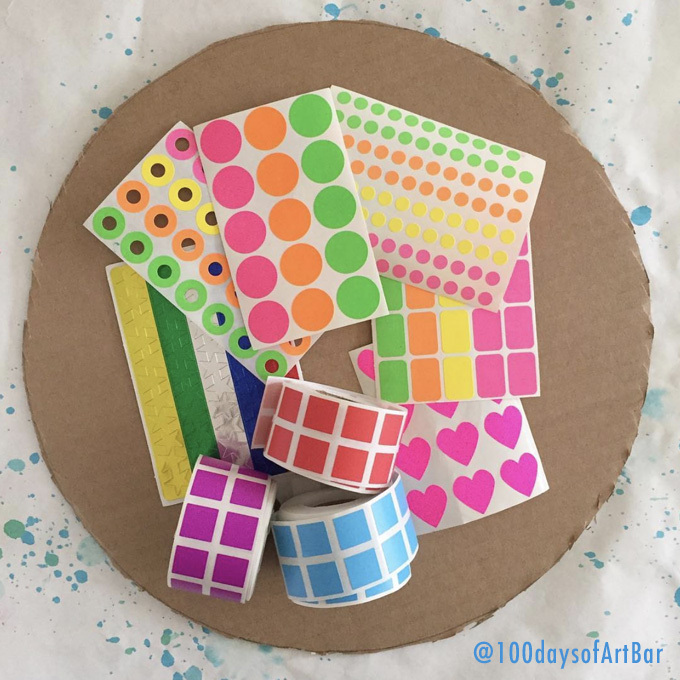 Younger kids will just explore the stickers. 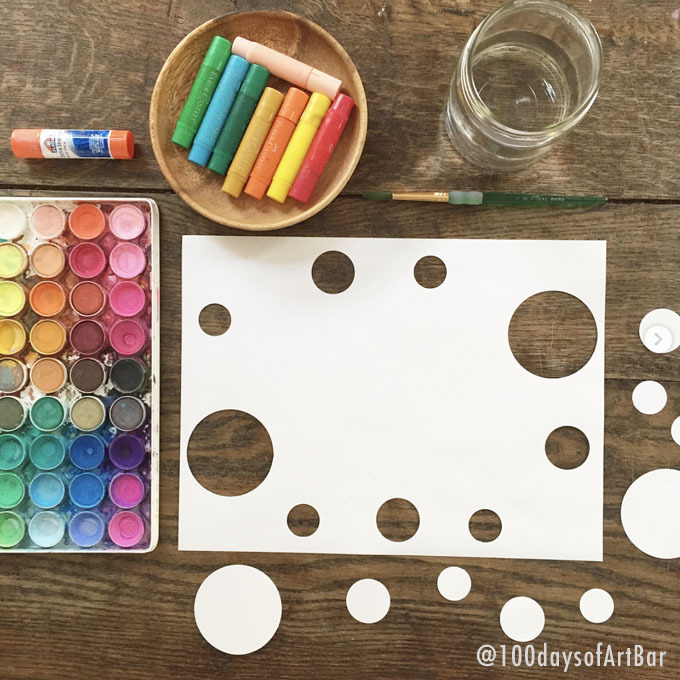 For older kids, they can find the middle with a ruler and then start with one sticker and continue around to create a mandala pattern. Use cereal box cardboard if you have it, it’s easier to cut. 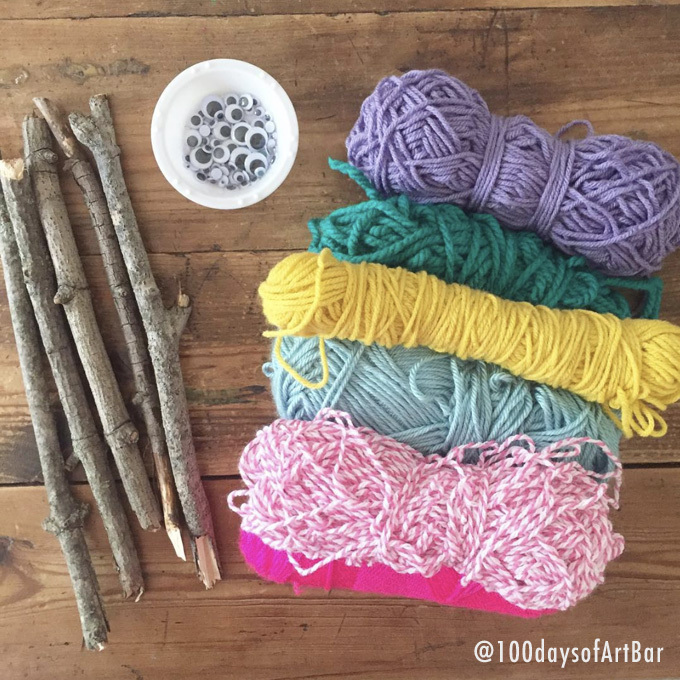 Wrapping sticks with yarn is a really good sequencing activity for little kids. First choose the colors, then cut a long piece, then start wrapping by holding down the end of the yarn and wrapping over it. Go around and around until the yarn is done. But yarn wrapped sticks in a vase for an artsy centerpiece. Or use googly eyes to make people or snakes. I do hope you will enjoy this advent calendar and not feel like it’s just more pressure. The last few days leading up to Christmas are no-mess days. And obviously you can skip a few days if need be! 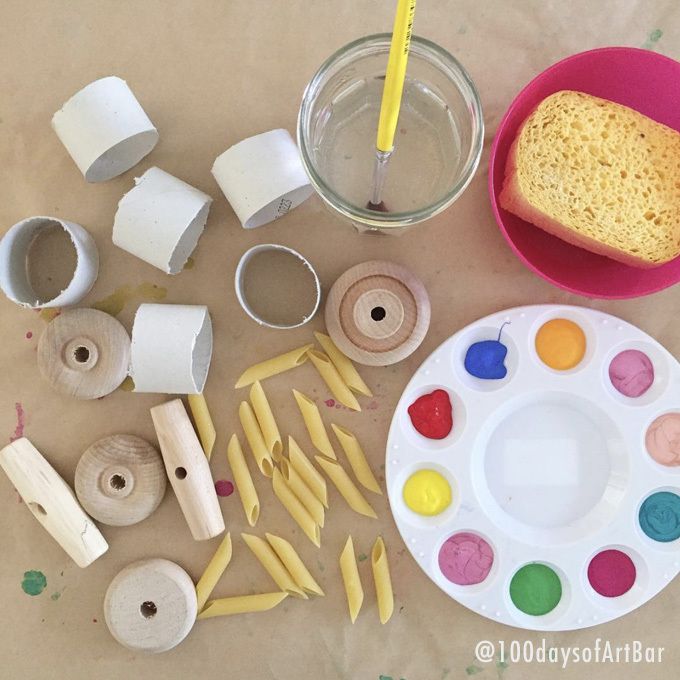 I just think that if you have a child who really loves art, and take about 10 minutes each day to set it up (and clean up from the day before) then this will actually be helpful because your child will be occupied while you do other things. At least that’s the hope! Love this creative advent calendar!